Our product range includes a wide range of washing machine carbon brushes and machine carbon brushes. 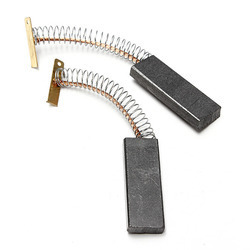 Manufactured in accordance with the set industry norms and guidelines, quality of this range of Washing Machine Carbon Brushes never deteriorates. Owing to this, the offered product is characterized by longer functional life and commendable performance. Further, its reasonable pricing, makes the product highly acclaimed and asked for in the market. Manufactured in accordance with the set industry norms and guidelines, quality of this range of Machine Carbon Brushes never deteriorates. Owing to this, the offered product is characterized by longer functional life and commendable performance. Further, its reasonable pricing, makes the product highly acclaimed and asked for in the market.